OBJECTIVE To consider whether earlier detection of otitis media with effusion (OME) in asymptomatic children in the first 4 years of life prevents delayed language development. METHODS MEDLINE and other databases were searched and relevant references from articles reviewed. Critical appraisal and consensus development were in accordance with the methods of the Canadian Task Force on Preventive Health Care. RESULTS No randomised controlled trials assessing the overall screening for OME and early intervention to prevent delay in acquiring language were identified, although one trial evaluated treatment in a screened population and found no benefit. The “analytic pathway” approach was therefore used, where evidence is evaluated for individual steps in a screening process. The evidence supporting the use of tools for early detection such as tympanometry, microtympanometry, acoustic reflectometry, and pneumatic otoscopy in the first 4 years of life is unclear. Some treatments (mucolytics, antibiotics, steroids) resulted in the short term resolution of effusions as measured by tympanometry. Ventilation tubes resolved effusions and improved hearing. Ventilation tubes in children with hearing loss associated with OME benefited children in the short term, but after 18 months there was no difference in comparison with those assigned to watchful waiting. Most prospective cohort studies that evaluated the association between OME and language development lacked adequate measurement of exposure or outcome, or suffered from attrition bias. Findings with regard to the association were inconsistent. CONCLUSIONS There is insufficient evidence to support attempts at early detection of OME in the first 4 years of life in the asymptomatic child to prevent delayed language development. Otitis media with effusion (OME) is common, with a prevalence of about 20% at age 2 years.1 2 It is often asymptomatic. 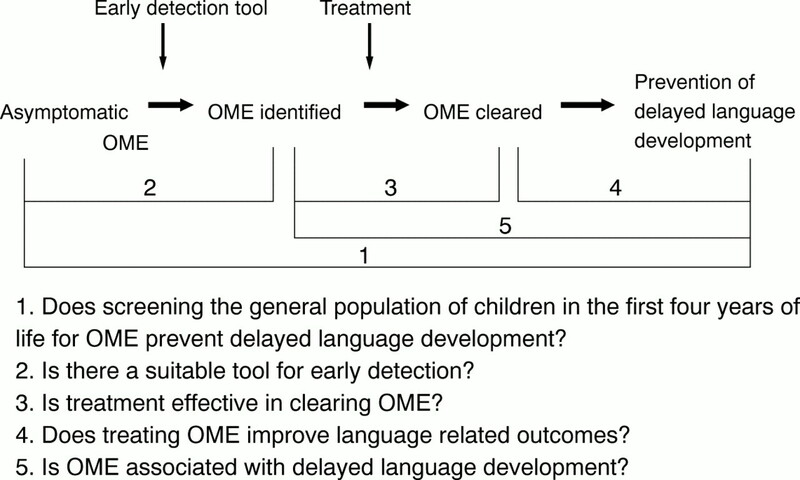 Some studies have found an association between OME and delayed language development,3 and this finding has led to the implementation of programmes for earlier detection of OME, although the evidence supporting attempts at earlier detection has been questioned.4 Clinicians conducting periodic health examinations or child health surveillance may question whether attempts at earlier diagnosis of OME should be included as a routine part of these examinations. Using the methods of the Canadian Task Force on Preventive Health Care,5 6 we considered the evidence for and against assessing asymptomatic children for OME. Our focus was the first 4 years of life because this is the period of most rapid language acquisition. Analytic pathway for the early detection of otitis media with effusion (OME) in the first 4 years of life to prevent delayed language development. Is there a suitable tool for early detection (step 2)? Is treatment effective in clearing effusions (step 3)? Does treating OME improve language related outcomes (step 4)? Is there is an association between OME and delayed language development (step 5)? MEDLINE was searched from 1966 to July 2000, focusing on screening (in general and in the early years), treatment (and subsequent language related outcomes), and the relation between OME and language delay. Key search terms used included otitis media with effusion (OME), middle ear effusion, developmental disabilities, learning disorders, child development, language development disorders, speech disorders, mass screening, sensitivity, and specificity. The Cochrane database of systematic reviews and controlled trials register, as well as the NHS centre for reviews and dissemination database were also searched for relevant studies and meta-analyses. Further studies were identified from manual searching of the indexes of studies identified by electronic searchers, from indexes of review studies, and from the index of the systematic review by the New Zealand health technology assessment clearing house for health outcomes and health technology assessment (http://nzhta.chmeds.ac.nz/screen.htm). If a meta-analysis of suitable quality was found, only relevant individual trials published after the meta-analysis were sought. findings published in abstract form or in conference proceedings only. STEP 1: DOES SCREENING THE GENERAL POPULATION OF CHILDREN IN THE FIRST 4 YEARS OF LIFE PREVENT DELAYED LANGUAGE DEVELOPMENT? We identified no trials assessing the entire screening process for OME (early detection and intervention), where subjects were randomised to be screened and treated if early abnormality is detected, or not screened. However, one trial assessed the impact of screening a general population of children aged 2 years and those with persistent effusions invited to participate in a randomised trial.1 10 11Owing to small numbers, the study lacked sufficient power to detect a clinically important effect. Three other “screening” studies were excluded because audiometry was the screening tool and subjects were not randomised.12-14 Two of these studies focused on older children.12 13 Three studies were excluded because referral rate was the outcome measure.15-17 Given the lack of evidence for or against screening for OME in the general population, we then explored the remaining steps in the analytic pathway (fig 1). STEP 2: IS THERE A SUITABLE TOOL FOR EARLY DETECTION? When assessing the properties of manoeuvres used for the early detection of OME, fluid found in the middle ear at the time of surgery is often considered the gold standard, rather than hearing loss associated with OME in primary care. As the prevalence of OME affects positive and negative predicative values of these manoeuvres, it is important that such characteristics be examined in community samples.55 Children in presurgery samples may also differ from those considered for early detection in other important variables such as age, duration of OME, and related conditions. These problems with candidate tools for early detection are compounded by the recurrent and fluctuating nature of OME: it is only long term OME that warrants treatment; a single measure of any type will fail to document clinically relevant chronicity. Children with positive tests would need to begin a period of observation with repeated testing. STEP 3: IS TREATMENT EFFECTIVE IN CLEARING OME? A meta-analysis concluded that patients with OME receiving oral S-carboxymethylcysteine or its lysine salt versus placebo benefited by avoiding surgical intervention 2.31 times more often (95% confidence interval (CI), 1.28 to 4.2; p < 0.01), and by reverting to normal tympanograms more often (odds ratio 2.25 (95% CI, 0.97 to 5.22); p = 0.058).59 Longer term effects such as recurrences were not reported. Studies included placebo and no treatment controls, but outcome assessors were blinded to treatment condition. In all but one of the six individual studies considered, confidence intervals for odds ratios included unity. The single study showing benefit included 19 subjects for analysis; the odds ratio favouring mucolytics was 18.92 (95% CI, 2.03 to 177.6). Williams and colleagues' meta-analysis examined the effectiveness of antibiotic prophylaxis of recurrent otitis media and found a rate difference of 0.11 favouring antibiotic treatment (95% CI, 0.03 to 0.19).60 Studies examining outcomes at one month following antibiotic treatment of OME had a rate difference favouring antibiotics of 0.16 (95% CI, 0.03 to 0.29). Studies without a placebo control group showed greater antibiotic effect than placebo controlled trials. Three studies evaluated hearing. There were no significant differences in outcomes between the groups that received placebo compared with antibiotics in studies of longer term outcome of OME, that is from six weeks to 11 months after starting treatment (rate difference 0.06 (95% CI, −0.03 to 0.14)). A systematic review of well designed randomised controlled trials examining the effectiveness of surgical interventions for OME concluded that ventilation tubes and adenoidectomy alone or in combination were equally effective.19 Meta-analysis was not possible because of variability across studies. On the basis of three studies, the authors estimated that the magnitude in reduction of hearing loss was on average 12dB at 6 months and under 6 dB after 12 months following surgery. There was a large variation in effect between children. Myringotomy alone, tonsillectomy alone, or combinations of the two were ineffective interventions. Ventilation tube insertion was noted to lead to tympanosclerosis and slightly increased the incidence of chronic perforation and cholesteatoma. Risks of surgery included exposure to an anaesthetic, possible psychological trauma, and a slight risk of haemorrhage after adenoidectomy. Between 20% and 35% of those receiving ventilation tubes experienced ear discharge, which was persistent in 5% of cases. STEP 4: DOES TREATING OME IMPROVE LANGUAGE RELATED OUTCOMES? The studies assessing language related outcomes are summarised in table 1. A randomised controlled trial examined the effect of treatment on language related outcomes in children recruited to the trial at the time of their first appointment at an otolaryngology clinic.75 Bilateral effusions and hearing loss were documented prospectively for at least 3 months, after which children were randomised to receive ventilation tubes within 6 weeks, or, if required, after a period of 9 months of “watchful waiting”. Nine months after randomisation, those assigned to the watchful waiting group had verbal comprehension and expressive language skills that were 3.24 months behind those in the early surgery group. Eighteen months after randomisation, 85% of the watchful waiting group had undergone tube insertion, and the groups no longer differed significantly with regard to language related outcomes. STEP 5: IS OME ASSOCIATED WITH DELAYED LANGUAGE DEVELOPMENT? Table 2 summarises the 13 groups of studies identified that considered the effect of OME on language acquisition during the first 4 years of life. Two studies had high internal validity. Lous and Fiellau-Nikolajsen and Lous et al screened more than 90% of two separate entire birth cohorts in a Danish municipality; follow up was achieved for more than 65% of the children in both cohorts who had significant OME.81 82 In these studies, cases were carefully matched with controls. No lasting effects from OME were found. However, outcome was measured at age 8 years, by which time children who had experienced OME may have caught up with their unaffected peers. In one of the studies, follow up evaluation involved only the silent reading word test. The remaining 11 study groups had methodological flaws that posed substantial threats to internal validity. Only three studies documented hearing loss associated with effusions.83-85 Reports from studies of the Nijmegen cohort suffered from possible attrition bias.86 87 Although documentation of OME was comprehensive and screening occurred at regular intervals, no attempt was made to follow up all screened subjects with language related assessments. For example, Peters and colleagues did not indicate how subjects were selected for language assessment from the original sample screened for exposure to OME.87 The extent of subject overlap across studies was not clear: it appeared that some children might have been included in more than one report of outcomes. If this was the case, the studies could not be considered independent. Few significant differences in language outcomes attributable to OME were found, despite multiple comparisons. Paradise and colleagues report follow up for a subsample of children enrolled in their ongoing study.85 Children from diverse backgrounds were enrolled by the age of 2 months and middle ear status was monitored at least monthly with hearing tests for those with ongoing OME. Children in this cohort who met inclusion criteria for a trial of treatment with ventilation tubes became ineligible. The remaining children represented a broad range of exposure to OME. They were randomly selected from the remaining cohort for evaluation of language development, speech, and sound production at 3 years of age. The percentage of variance in scores for receptive vocabulary and verbal aspects of cognition explained by time with OME in the first year of life, beyond that explained by sociodemographic variables, ranged from 1.2% to 2.9%. There were no significant correlations between time with OME and scores on measures of spontaneous expressive language, speech and sound production, or other measured aspects of cognition. The two studies by Teele and colleagues should be considered to be one study as the reports followed essentially the same children at different times.90 91 Duration of OME was calculated by extrapolation from the number of episodes of acute otitis media. Those followed up at 3 years were not randomly selected from the original cohort, and less than 10% of those initially recruited underwent language assessments at the follow up points. At 3 years of age, children with OME had lower scores on the three tests used to assess speech and language. At the 7 year follow up, the relation between time with OME and language was significant in two of nine comparisons. Kinshkowy and colleagues explored the association between recurrent otitis media and language outcomes.92 As in the studies by Teele and colleagues, inferences were made about duration of effusions from documented episodes of acute otitis media. More than 80% of the participants were assessed at follow up at 2 and 3 years of age, during the period when effects of exposure might be most apparent. A multivariate analysis included social variables and otitis media history and showed that only recurrent otitis media made a statistically significant contribution to the overall developmental quotient and specifically to its language subsection at 2 years of age. The study by Wright and colleagues93 had several methodological weaknesses. Recruitment occurred in the context of a study on vaccinations, leading to possible “volunteer bias.” Follow up of the original sample fell below 50%, and blinding of language assessors to otitis history was not mentioned. No measure of otitis media influenced language outcomes. Vernon-Feagans and colleagues documented exposure meticulously, but the sample numbers were small (n = 36, 46, and 36), and it was not clear if their studies were independent.83 84 94 The findings supported the “cumulative effects model,” in that an association was only found for chronic otitis media and language outcomes among those attending day care of poorer quality. It was not appropriate to combine the data from studies in table 2 owing to the variability in outcome, assessment of exposure, attrition, and duration of follow up. Although the association between OME and language development has undergone considerable investigation, few studies have directly addressed the question of early detection in the first 4 years of life. The analytic pathway approach is therefore particularly important to consider when examining the evidence for or against early detection. We identified no randomised controlled trials examining the overall process of screening for OME in the first 4 years of life with a preventive manoeuvre for adverse language outcomes. However, one trial screened children and then randomised those with persistent effusions to be treated with ventilation tubes or not. No effect on language was identified but there was probably insufficient power to detect a clinically important difference (step 1 in the analytic pathway). Various manoeuvres for early detection are available, but performance has not been adequately assessed in community settings, where the prevalence and severity are lower than in presurgery groups. Indeed, manoeuvres have to be evaluated against each other in this setting, where it is not possible to use the gold standard of documented hearing loss associated with the presence of middle ear fluid found at tympanocentesis (step 2 in the analytic pathway). No single reading can give an indication of chronicity, which is crucial in a condition that fluctuates and is often self limiting. Most treatments were evaluated in populations identified through usual care. Studies of antibiotics have shown some short term benefit in clearing effusions (step 3 in the analytic pathway), but long term resolution of effusions has not been demonstrated. Antibiotics helped to reduce recurrences of acute otitis media. Evidence for benefit in the short and medium term must be considered in the context of rising bacterial resistance, side effects, and lack of evidence for long term improvement in hearing in children with OME. A meta-analysis of trials of mucolytics suggests possible short term benefit. Surgical management alone or in combination cleared fluid and improved hearing—a systematic review showed ventilation tubes and adenoidectomy were equally effective, with some evidence suggesting the combination was better than either procedure alone. Treatment effectiveness studies generally used intermediate outcomes of effectiveness, such as resolution of OME based on tympanometry. Thus it is not known whether early detection of OME with subsequent treatment using methods other than ventilation tubes prevents adverse language outcomes. There is good evidence that treatment of OME with ventilation tubes compared with watchful waiting improves language outcomes at 9 months (step 4 in the analytic pathway). However, by 18 months, differences were no longer apparent. This was a study of management among children referred to an otolaryngology clinic and not an evaluation of additional interventions for earlier detection. Consequently, this trial does not provide evidence to support attempts at earlier detection of OME. With regard to step 5 in the analytic pathway, in five study groups there was no association between OME and language outcomes, while in eight study groups a minority of analyses showed a significant association. Sociodemographic variables appeared to account for more of the variance in measures of language development than exposure to OME. There was substantial variability across study groups in measurement of exposure (severity, laterality, associated hearing loss, and persistence of OME) and in outcome, and many of the studies had major methodological weaknesses. For example, not all children with effusions suffer from significant hearing loss, a factor that is often considered as the causal link between OME and language delay; a wide range of language and developmental outcomes was used, and the clinical importance of results obtained with these measures was not clear; and interpretation of significant findings was difficult because of the broad array of language tests used without accompanying information about the clinical importance of change scores. In addition, there was a high rate of intervention for OME in the studies, which may have affected the outcomes. On the basis of these findings we conclude that there is insufficient evidence to make recommendations for or against the use of tympanometry, microtympanometry, acoustic reflectometry, and pneumatic otoscopy for the earlier detection of OME in the general population of children up to 4 years of age. There is insufficient evidence to recommend early detection of OME in children in the first 4 years of life to prevent delayed language development. Tools for early detection should be evaluated in settings of low prevalence. Future studies on the identification, effects, and treatment of OME should document hearing loss associated with OME prospectively over time. Unilateral OME is unlikely to result in hearing loss warranting intervention, and laterality should be reported. Outcomes should include behavioural assessments (for example, measures of concentration) as well as language assessments. The reliability and validity of these outcome measures should be described, and clinically important differences specified. Regarding screening the general population for OME, a randomised controlled trial which allocates children at the level of exposure to strategies for early detection would be necessary to determine the effectiveness of the overall screening process (early detection and subsequent management) in preventing language delay. However, such a resource intensive trial is not justified without evidence that OME causes clinically important deficits in language and other developmental outcomes that can be reduced with treatment. We are grateful to The Canadian Task Force on Preventive Health Care for their contributions to a technical report on this topic. Also, the following peer reviewers for the Task Force made helpful comments on drafts of the technical report: Drs Alfred O Berg, Department of Family Medicine, University of Washington School of Medicine, Seattle, Washington, USA and Chair, US Preventive Services Task Force; Larry Culpepper, Department of Family Medicine, Boston University Medical Center, Boston, Massachusetts, USA; Mark Haggard, MRC Institute of Hearing Research Nottingham, United Kingdom; and Jørgen Lous, Institute of General Practice, Aarhus University, Denmark. The views expressed in this paper are those of the authors and the task force and do not necessarily reflect the positions of the reviewers. CCB was supported by an NHS Wales Office for Research and Development for Health and Social Care clinical research fellowship. HLM was supported by a faculty scholar award from the WT Grant Foundation. (1989) Screening for otitis media with effusion in preschool children. Lancet i:311–313. (1983) Epidemiology of secretary otitis media: a descriptive study. Ann Otol Rhinol Laryngol 92:172–177. (1997) Language and otitis media. in Otitis media in young children: medical, developmental, and educational considerations. eds Roberts JE, Wallace IF, Henderson FW (Paul H Brookes Co, Baltimore), pp 133–161. (1995) Secretary otitis media in schoolchildren: is screening for secretary otitis media advisable? Danish Med Bull 42:71–99. (1990) Assessing the clinical effectiveness of preventive maneuvers: analytic principles and systematic methods in reviewing evidence and developing practice recommendations. J Clin Epidemiol 43:891–905. (1989) The periodic health examination: 1989 update part 3, preschool examination for developmental, visual and hearing problems. Can Med Assoc J 141:1136–1140. (1988) Making recommendations on preventive practices: methodological issues. in Implementing preventive services. eds Battista R, Lawrence R (Oxford University Press, New York), pp 53–67. (1990) Assessing the clinical effectiveness of preventive maneuvers: analytic principles and systematic methods in reviewing evidence and developing clinical practice recommendations. J Clin Epidemiol 43:891–905. (1979) The periodic health examination. Can Med Assoc J 121:1193–1254. (1991) The effect of treatment with ventilating tubes on language development in preschool children with otitis media with effusion. Clin Otolaryngol 16:128–132. (1993) Long term effects of otitis media with effusion on language, reading and spelling. Clin Otolaryngol 18:234–241. (1980) Effects of preschool screening for vision and hearing on prevalence of vision and hearing problems 6–12 months later. Lancet ii:1014–1016. (1990) The preventive value of audiometric screening of preschool and young school-children. Int J Pediatr Otorhinolaryngol 20:51–62. (1992) Follow-up of participants in a preschool hearing screening program in child care centres. Can J Pub Health 83:375–378. (1996) Evaluation of an otitis media with effusion screening pilot program. NZ Med J 109:384–386. (1990) Application of pass fail criteria to middle ear screening results. ASHA 22:839–840. (1985) Pure-tone and acoustic immittance screening of pre-school aged children: an examination of referral criteria. Ear Hear 6:245–250. (1999) Sensitivity, specificity and predictive value of tympanometry in predicting a hearing impairment in otitis media with effusion. Clin Otolaryngol 24:284–300. (1992) The treatment of persistent glue ear in children: Are surgical interventions effective in combating disability from glue ear? Effective Health Care 4:1–16. (1992) The epidemiology of childhood hearing impairment: factors relevant to planning of services. Br J Audiol 26:77–90. (1982) Normal tympanometric shape. Ear Hear 3:241–245. (1992) Tympanometry and otoscopy prior to myringotomy: issues in diagnosis of otitis media. Int J Pediatr Otorhinolaryngol 24:101–110. (1998) Comparison of spectral gradient acoustic reflectometry and other diagnostic techniques for detection of middle ear effusion in children with middle ear disease. Pediatr Infect Dis J 17:556–559. (1987) Persistent middle ear effusions in children with recurrent acute otitis media. Clin Otolaryngol 12:97–101. (1980) Tympanometry and middle ear effusion: a cohort study in three year old children. Int J Pediatr Otorhinolaryngol 2:39–49. (1992) Towards the validation of aural acoustic immittance measures for diagnosis of middle ear effusion in children. Ear Hear 13:442–453. (1992) Identification of middle ear dysfunction in young children: a comparison of tympanometric screening procedures. Ear Hear 13:63–69. (1995) Tympanometric screening in elementary school children. Audiology 34:6–12. (1993) Microtympanometry, microscopy and tympanometry in evaluating middle ear effusions prior to myringotomy. NZ Med J 106:386–387. (1992) The Welch Allyn audioscope and microtymp: their accuracy and that of pneumatic otoscopy, tympanometry and pure tone audiometry as predictors of otitis media with effusion. J Laryngol Otol 106:600–602. (1994) Validation of a portable tympanometer for use in primary care. Int J Pediatr Otorhinolaryngol 29:219–225. (1997) Minitympanometry in detecting middle ear fluid. J Pediatr 131:419–442. (1992) Diagostic value of microtympanometry in primary care. BMJ 304:96–98. (1988) Clinical evaluation of a portable, cordless, hand-held middle ear analyzer. Otolaryngol Head Neck Surg 99:348–350. (1991) Tympanometry in the detection of hearing impairments associated with otitis media with effusion. Clin Otolaryngol 16:157–159. (1994) Tympanometry, stapedius reflex and hearing impairment in children with otitis media with effusion. Acta Otolaryngol (Stockh) 114:410–414. (1987) Validity of acoustic reflectometry in detecting middle ear effusion. Pediatrics 79:739–742. (1991) Impedance tympanometry and acoustic reflectometry at myringotomy. Pediatrics 87:475–480. (1987) Efficacy of acoustic otoscope in detecting middle ear effusion in children. Laryngoscope 97:495–498. (1993) Evaluation of acoustic reflectometry in detecting otitis media in children. Br J Audiol 27:409–414. (1991) Predictive value of the angle of acoustic reflectometry. Pediatr Infect Dis J 10:214–216. (1998) Spectral gradient acoustic reflectometry for the detection of middle ear effusion by pediatricians and parents. Pediatr Infect Dis J 17:560–564. (1997) Use of acoustic reflectometry in the detection of middle ear effusion. J Am Acad Audiol 8:181–187. (1992) Acoustic-immittance screening for detection of middle-ear effusions in children. J Am Acad Audiol 3:262–268. (1999) Predictive value of acoustic reflectometry (angle and reflectivity) and tympanometry. Int J Pediatr Otorhinol 48:137–142. (1985) The acoustic reflectometer as a screening device: a comparison. Ear Hear 6:307–314. (1987) Acoustic reflectometry detection of middle ear effusion. Pediatr Infect Dis J 6:866–868. (1986) Efficacy of acoustic reflectometry in detecting middle ear effusion. Ann Otol Rhinol Laryngol 95:472–476. (1998) Pneumatic otoscopy: a review of the literature. Issues in Comprehensive Pediatric Nursing 21:117–128. (1999) The diagnostic and prognostic value of eardrum mobility in OME. Eur Arch Otol Rhinol Laryngol 256:189–191. (1985) Study of middle ear disease using tympanometry in general practice. BMJ 290:1953–1956. (1979) Design factors in the characterization and identification of otitis media and certain related conditions. Ann Otol Rhinol Laryngol 5:13–18. (1980) Identification of otitis media with effusion in children. Ann Otol Rhinol Laryngol 89:s190–s195. (1994) Otitis media with effusion in young children. Clinical practice guideline. Number 12. (Agency for Health Care Policy and Research, Public Health Services, US Department of Health and Human Services, Rockville, Maryland). (1996) Clinical epidemiology: the essentials. (Williams and Wilkins, Baltimore, Maryland). (1974) Impedance audiometry as a screening procedure for middle ear disease. Trans Am Ophthalmol Otol 78:98–102. (1993) Reproductibilité interobservateur d'un tympanomètre portatif, le Micro Tymp. Can Med Assoc J 148:559–564. (1999) Tympanometry by general practitioners: reliable? Int J Pediatr Otorhinolaryngol 48:117–123. (1996) Otitis media with effusion and S-carboxymethylcysteine and/or its lysine salt: a critical overview. Int J Pediatr Otorhinolaryngol 35:231–241. (1993) Use of antibiotics in preventing recurrent acute otitis media and in treating otitis media with effusion. JAMA 270:1344–1351. (1992) Meta-analysis of antibiotics for the treatment of otitis media with effusion. Otolaryngol Head Neck Surg 106:378–386. (1996) Efficacy of antimicrobial prophylaxis for recurrent middle ear effusion. Pediatr Infect Dis 15:1074–1082. (1996) Double-blind randomised trial of co-amoxicalv versus placebo for persistent otitis media with effusion in general practice. Lancet 348:713–716. (1998) Epidemiology and treatment of otitis media with effusion in children in their first year of primary school. Acta Otolaryngol (Stockh) 118:557–562. (1991) Systemic steroids for otitis media with effusion in children. Arch Otolaryngol Head Neck Surg 117:984–989. (1997) Single dose of betamethasone in combined medical treatment of secretory otitis media. Ann Otol Rhinol Laryngol 106:359–363. (1998) Intranasal beclomethasone as an adjunct to treatment of chronic middle ear effusion. Ann Allergy Asthma Immunol 80:198–206. (1993) Spontaneous resolution of severe chronic glue ear in children and the effect of adenoidectomy, tonsillectomy, and insertion of ventilation tubes (grommets). BMJ 306:756–760. (1994) The long term outcome of secretary otitis media in children and the effects of surgical treatment: a ten year study. Acta Otorhinolaryngol Belg 48:317–324. (1999) Adenoidectomy and adenotonsillectomy for recurrent acute otitis media. JAMA 282:945–953. (1999) Systematic review of autoinflation for treatment of glue ear in children. BMJ 318:1177–1178. (1989) Effect of naproxen, a prostaglandin inhibitor, on acute otitis media and persistence of middle ear effusion in children. Ann Otol Rhinol Laryngol 98:389–392. (1986) Naproxen in otitis media with effusion. J Laryngol Otol 100:263–266. (1999) A randomized comparison of homeopathic and standard care for the treatment of glue ear in children. Complementary Ther Med 7:132–135. (1999) Early surgery compared with watchful waiting for glue ear and effect on language development in preschool children: a randomised trial. Lancet 353:360–363. (1985) Total actual speaking time in infants and children with otitis media with effusion. Int J Pediatr Otorhinolaryngol 10:171–180. (1987) Predictors of phonologic inadequacy in young children prone to otitis media. J Speech Hearing Dis 52:232–242. (1993) The effects of ventilation tube placement on hearing, speech, language, cognition and behaviour. Acta Otorhinolaryngol Belg 47:27–32. (1997) Effects of otitis media with effusion on gross motor ability in preschool-aged children: preliminary findings. Pediatrics 99:334–337. (1997) Long-term effects of ventilation tubes for persistent otitis media with effusion in children. Clin Otolaryngol 22:423–429. (1984) A 5-year prospective case–control study of the influence of early otitis media with effusion on reading achievement. Int J Pediatr Otorhinolaryngol 8:19–30. (1988) Secretary otitis media and language development: a six-year follow-up study with case control. Int J Pediatr Otorhinolaryngol 15:185–203. (1997) The effect of otitis media and quality of day care on children's language development. J Appl Dev Psychol 18:395–409. (1996) Otitis media and the social behaviour of day-care-attending children. Child Dev 67:1528–1539. (2000) Language, speech sound production, and cognition in three-year-old children in relation to otitis media with effusion in their first three years of life. Pediatrics 105:1119–1130. (1993) The effect of early bilateral otitis media with effusion on language ability: A prospective cohort study. J Speech Hearing Res 36:1004–1012. (1994) The effects of early bilateral otitis media with effusion on educational attainment: a prospective cohort study. J Learn Disabil 27:111–121. (1990) Language learning in a prospective study of otitis media with effusion in the first two years of life. J Speech Hearing Res 33:188–194. (2000) Otitis media, fluctuant hearing loss, and speech–language outcomes: a preliminary structural equation model. J Speech Language Hear Res 43:100–120. (1984) Otitis media with effusion during the first three years of life and development of speech and language. Pediatrics 74:282–287, for the Greater Boston Otitis Media Study Group. (1990) Otitis media in infancy and intellectual ability, school achievement, speech, and language at age 7 years. J Infect Dis 162:685–694. (1991) Effect of otitis media on development: a community-based study. Early Hum Dev 26:101–111. (1988) Impact of recurrent otitis media on middle ear function, hearing and language. J Pediatr 113:581–587. (1994) The effect of otitis media on the attention skills of day-care-attending toddlers. Dev Psychol 30:701–708. (1991) Screening children's hearing: a review of the literature and the implications for otitis media. (HMSO, London). Additional data has been provided in table format by Chris Butler et al.